Location: Located just several minutes walking distance away from the first station of the Gondola ski lift, Sunrise Park & Spa Hotel represents one imperceptible gradational combination of traditional for the region architecture, modern comfort and good service. Mostly natural materials, creating coziness and warmth, has been used for its construction and furnishing. 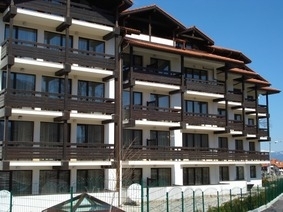 Accommodation: The complex offers 192 beds distributed within 81 apartments with various size and disposition, discovering magnificent views toward the mountains surrounding Bansko – Rila and Pirin. All apartments offer with 21” TV, telephone, Internet, living room, extendable sofa, kitchenette with electric cooker, refrigerator, aspirator. Facilities: Some of the facilities offered on premises include ski stirage, conference room, restaurant, well equipped spa center with swimming pool, luggage room, 1500 m2 Landscaped gardens and BBQ, underground parking lots, and others.